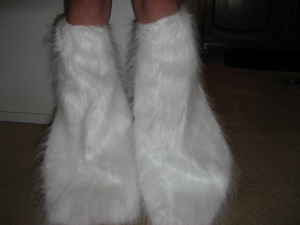 theAd>>I have a pair of Brand NEW white faux- fur leg warmers/ boot covers for sale. These have never been worn except for the picture. They are generally one- size- fits- all, as they have an elastic band to insure they don't slip down. They are large enough at the bottom to cover most boots. They are a ton of fun for costumes, parties, dancers, or anyone with a unique sense of style. These leg warmers draw attention! Really. This can not be the original purpose for these. Did ya F@$% up the Christmas tree skirts you were making for your family? Or seriously, how bad are your cankles? Something tells me you and the hubby might be playing a little Clydesdale and Bud Wagon...if ya know what I mean. "They are a ton of fun for costumes [NO], parties [NO], dancers [EXOTIC! ], or anyone with a unique [HORRIBLE and CONFUSING] sense of style. These leg warmers draw attention! [yeah that is probably true]"
" They are hand- made [really, no sign of mass production on the horizon? hmm], and I can also take custom orders for special sizes [dear god] and other colors [oh yes, a bright color could draw more attention!]. :) [stop smiling, your'e dumb]"